New York lawmakers began cementing their hard-fought budget by approving a ban on single-use plastic bags. As a midnight Sunday deadline neared, the state’s Democratic machinery had yet to pass two more contentious items: a “mansion tax” and congestion pricing for parts of Manhattan. The state becomes only the second, along with California, to ban disposable plastic grocery bags, forcing residents to pay for paper bags or re-use their own on grocery store visits, starting March 2020. The measure is intended to reduce the 71,000 tons in plastic bags used annually just in New York City, according to the Citizens Budget Commission. 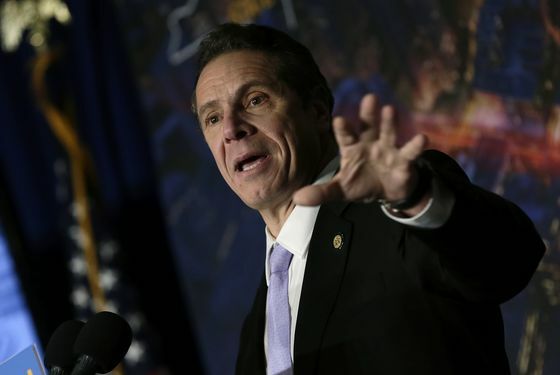 “This is the broadest most sweeping state plan that we have done, there are a number of national firsts and it really grapples with the tough issues that have been facing the state for a long time,” Governor Andrew Cuomo told reporters in Albany on Sunday. Cuomo and state legislative leaders agreed earlier on a 2020 spending plan that keeps budget growth at 2 percent for the ninth consecutive year while boosting education aid and providing middle-class tax relief. Lawmakers continued working to turn the budget deal into law, though Albany tradition suggests the process might tip over into Monday. While well-established in London, New York would be the first in the U.S. city to charge drivers for access. Congestion pricing is projected to raise $1 billion, to be used to pay debt service on $15 billion in bonds for New York’s Metropolitan Transportation Authority, which runs the city’s subway. Details of the program, such as how much to charge motorists and who might be exempted, remain to be hashed out by the MTA’s Triborough Bridge and Tunnel Authority, with implementation slated to begin after Dec. 31, 2020. Electronic monitors will be placed on the perimeter of a midtown Manhattan zone south of 60th Street. In another measure to bolster the MTA, lawmakers are being asked to approve a progressive tax on mansions with a combined top rate of 4.15 percent on the sale of properties valued at $25 million or more. Also part of the legislation is a criminal-justice package that includes elimination of cash bail for about 90 percent of defendants awaiting trial on misdemeanors and low-grade felony charges. What to do with those accused of the most serious crimes remains a question for more negotiation, Assembly Speaker Carl Heastie said Friday. The so-called mansion tax would establish a new scale of graduated levies, starting at 1 percent on all New York City apartments selling for more than $1 million, rising at $2 million and reaching a top of 4.15 percent on $25 million. It’s expected to raise $365 million, to borrow about $5 billion. The old tax imposed a flat 1 percent rate at $1 million or more on all apartments. “From the beginning, I said we will not do a budget that fails to address three major issues that have evaded this state for decades -- the permanent property tax cap, criminal justice reform and an MTA overhaul including Central Business District Tolling,” said Cuomo, a Democrat whose state is the U.S.’s third-biggest regional economy.